You can search for free gadgets to add to your own webpages in our directory of gadgets for your webpage. To display a gadget, just pick the one you like, set your preferences, click "Get code," and copy-and-paste the HTML onto your own page. Add some 'bling' to your site and 'wow' your readers! Creating Google Gadgets from your own content for others to use isn't hard, either -- anyone with even a bit of web design experience can make a simple one in HTML, and more advanced programmers can create really snazzy complex applications. But remember, it’s also quick and easy for people to delete gadgets and add new ones to their own pages. To help you make sure your gadget will be popular across the web, we provide a few guidelines to keep in mind. The more valuable visitors find your content, the longer they'll keep your gadget on their pages, the more often they’ll visit your site -- and the better that can be for your AdSense performance. If your website has a feed, visitors can put snippets of your content on their own Google homepages quickly and easily -- you won't even need to develop a gadget. However, you'll be able to customize your visitors' experience much more with a gadget than with a feed. By putting the "Add to Google" button in a prominent spot on your site, you can increase the reach of your content, because visitors who click to add your gadget or feed to Google can see your content each time they visit the Google homepage. Promoting your own gadget or feed can also increase its popularity, which contributes to a higher ranking in the Google personalized homepage directory. Wouldn't it be great to get your content in front of people while they're visiting Google.com or other webpages? More eyeballs on your site means more opportunities for your content to reach visitors, along with, of course, your AdSense ads. Google Gadgets enables you to do just that. Gadgets are miniature devices that offer cool, dynamic content ranging from games to news clips to weather reports to just about anything you can dream up. They've been around for a while, but their reach got a lot broader last week when we made it possible for anyone to add gadgets to their own webpages. That means you! 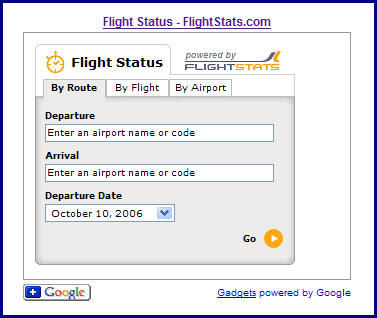 Here's an example of a flight status tracker, for instance, that can be placed on any page on the web.